A degree in music education requires a couple of classes working with accommodations and what will most benefit students to fit their needs. I have been teaching private lessons to students with special needs through Northwest Special Recreation Association (NWSRA) for nearly five years. Most of my students there are on the autism spectrum or have Downs Syndrome. Some students are high functioning (and can even drive! ), while others are non-verbal. I've had over 50 students through NWSRA and currently (as of summer 2016) have about 20 students per week. 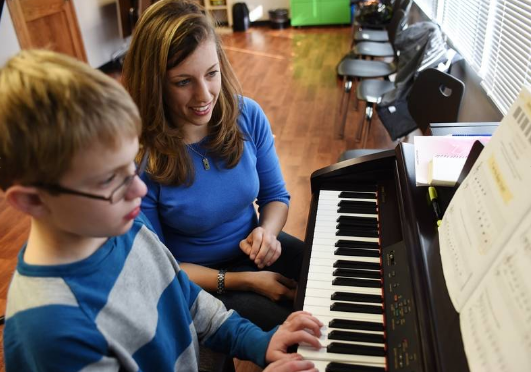 Although most of my students with special needs are through NWSRA, I do also teach lessons privately in my home studio with students from all over the Chicago area. ​Photo courtesy of Daily Herald. Some of the accommodations that I make include working with students at a pace that they understand, explaining the same thing different ways, and honing in on finger dexterity/independence and fine motor skills, all while playing pieces that aren't too challenging. For guitar, I use a device called a ChordBuddy - it fits on the neck of the guitar, allowing students who struggle with fine motor skills to be able to play four chords. With piano, I use a lot of games, color coding, worksheets, using gloves on the hands to label finger numbers, and A LOT of singing. If a student can sing it, s/he can play it! An article about how I work with students with special needs has been featured in the Daily Herald Northwest Suburbs edition in April of 2016 and can be found here.